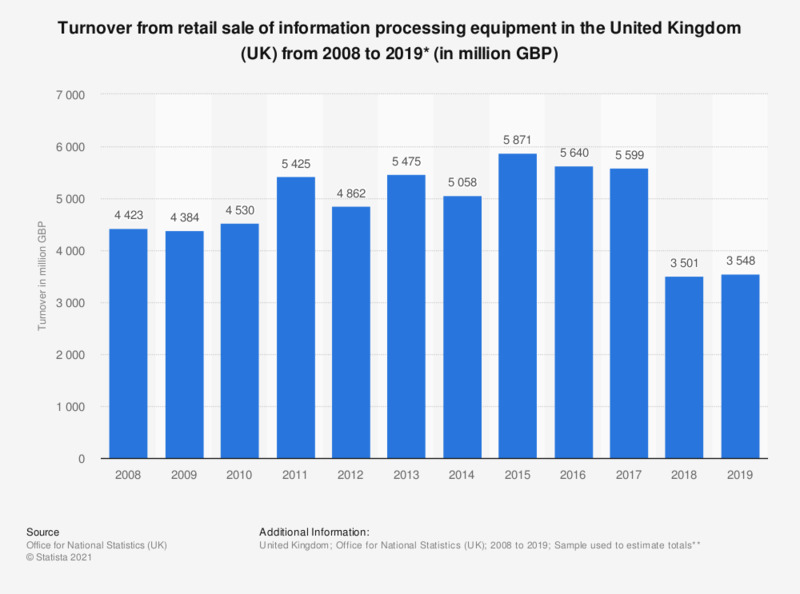 This statistic shows the total annual turnover of the retail sales of information processing equipment (including printers, software, calculators and typewriters) in the United Kingdom, from 2008 to 2016. Over this period, turnover from retail sales of such equipment has increased from 4.42 billion British pounds in 2008 to its highest point in 2013 where figures reached 5.4 billion British pounds. * Includes printers, software, calculators and typewriters. ** The Annual Business Survey uses a sample of data from 62,000 businesses in the Non-Financial Economy in Great Britain and 11,000 in Northern Ireland to draw estimate totals for the whole business population.